Ruth Gunderson, age 86 of Glenwood, died Saturday, July 7, 2018 at her home under the care of hospice. A Memorial Service will be held at 11:00 a.m. on Friday, July 20th at the First Baptist Church in Glenwood with Pastor Andy Lewis officiating. Visitation will the day of the service starting at 9:30 a.m. and will go until the time of the service. Inurnment will be at a later date in Solem Lutheran Cemetery in Kensington. Arrangements are with the Hoplin-Hitchcock Funeral Home in Glenwood. Ruth Gertrude Perkins was born July 20, 1931 in Superior, Iowa to Robert Ellsworth and Gertrude (Yule) Perkins. She attended School in Milford & Superior, Iowa graduating from Superior. She attended Estherville Junior College (now Iowa Lakes Community College). On November 5th, 1950 she married G.E. “Ben” Doughty in Estherville, Iowa. They had six children. Ruth worked at J.C. Penney before becoming a nursing home administrator. She took the state and national nursing home administrator’s examinations the first year they were offered. She served as administrator at Winthrop Care Center from 1970 until moving to Glenwood in 1972, then Hoffman Care Center from 1972-1978. She was administrator of Lakeview Care Center from 1978 until she retired in May of 1996. These homes are all part of the Good Samaritan Society now. Ruth was the first woman to attend and then join the Glenwood Rotary. 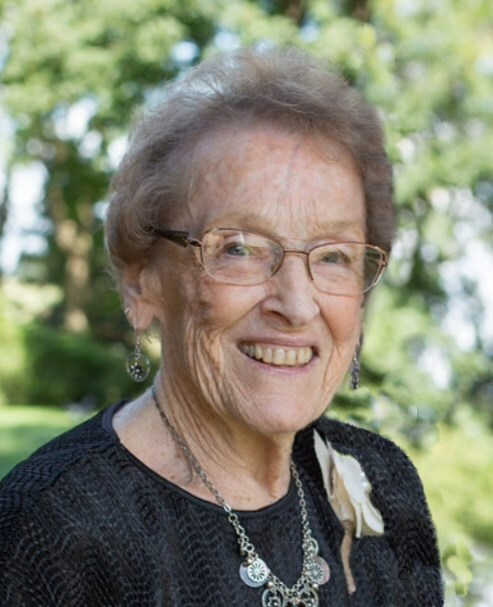 She served on the boards of Minnewaska Golf Course, the Glenwood City Council and Lakeview Good Samaritan Center. She was a member of First Baptist Church in Glenwood and was treasurer or assistant treasurer for 22 years. Ruth married Byron Gunderson on March 10, 1979. They did much traveling, visiting all but five of the United States, also England, Norway and Sweden, and visiting Portugal with her son, Craig. Byron and Ruth spent 15 winters in McAllen, Texas. Her pride and joy were her family. She loved spending time with the grandchildren and great grandchildren. She went to be with her Lord on July 7, 2018. She is survived by her children; Randy (Sarah Swanson) Doughty, Plainview, MN, Craig Doughty, Tower, MN, David (Wendy) Doughty, Bozeman, Montana and Seward Alaska, Laura (Tom) Hainlen, North Oaks, MN, LuAnne (Paul) Strand, Glenwood, MN, Bobbi (Kevin) Holtberg, Waconia, MN, Jon (Teresa) Gunderson, Dalton, MN, Leighton (Shari) Johnsrud, Foley, MN, Jennifer Doughty-Gabor, Lake City, MN, Patricia Doughty, Mound, MN, Rosanne Doughty-Detmer, St. Louis Park, MN, 25 grandchildren, 36 great grandchildren; sister, Muriel (Sherman) Kumba, Fairmont, MN, sisters-in-law, Lorraine Perkins, Clear Lake, South Dakota, JoAnn Perkins, Estherville, Iowa and Donna Gunderson, brothers-in-law, Ralph McDonald, Estherville, Iowa and Marvin (Bergetta) Gunderson and many nieces and nephews. She was preceded in death by, husband, Byron Gunderson, her parents, her sisters, Helen Campbell, Reva Powell, Margie McDonald, brothers, Ralph Perkins, Harry Perkins, Frank Perkins, brothers-in-law Chuck Campbell, Robert Powell and Harvey Gunderson, sister-in-law Barb Perkins and granddaughter, Leah Christine. Memorial donations to Glacial Ridge Hospice and Homecare Program, Glenwood, MN.